Pocket PC Users, I Think Pocket e-Sword is the Best Bible Reader Program You’re Going to Get For a Good Price. So I got this new Treo 800w and for you that need something with it’s features I find it to be a good device. But I was searching around for a good compatible Bible reader program at a fair price. I found FREE to be a very compelling price point 😀 . I mean with Windows Mobile, there are so many free software packages at sites like Freewarepocketpc.net, there was no point looking “high end” in terms of price for Bibles to read on the Pocket PC. In my searching of various sites, I eventually found Pocket e-Sword and I must say, for the price of free, it’s better than many if not all of the fee based packages I was considering. You can get the reader program and many Bibles and Bible tools for the Pocket PC on this page, but you need to have the Pocket e-Sword (the reader program) installed first. I mean what can beat trying the full featured package for free 😀 ? Some Bible versions and tools are fee based, but I’ve found any fees are cheaper than the cost of those same versions using other Pocket PC software. So Pocket e-Sword is a big time value, even for things that have a small fee attached. There is a Windows desktop version of the software I have never tried, but it’s available at the site’s main front page, also free. Now given most of the software is given freely, the site owner humbly request that donations be given, to help keep the site online. (Anything fee based on the site is because the copyright holders of that content make it so and the associated fees for that content are to pay them.) If you use and enjoy the software, consider the donation page, to help keep a good thing going. 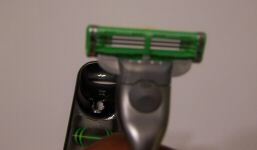 Gillette M3 ( Mach 3 ) Power versus Schick Quattro Power Razor, my trial of both! For over 100 years Gillette and Schick have held a fierce razor battle. I put their 2 newest disposable razors to the test. 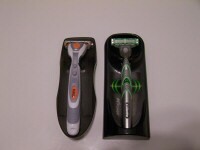 The Gillette M3 Power and the Schick Quattro Power Razor. The powered versions of the two top of the line face slicers 🙂 . Quattro Power on left, M3 Power on right. In many online discussions about these razors they are treated with a bit of scorn. With much of the talk surrounding people saying they would NEVER pay the high prices for the razors and their replacement blades. Call me a nut. (Hey being Conservative I’ve been called worse.) But I enjoy trying various shaving tools from time to time. And Gillette’s financials show plenty of people are out there buying these expensive razors with me. I’ve tried the dry electric razors and really like the Braun Clean and Charge system best. It’s probably the fastest shave you can get! But for me it was not the closest. And being a Black man I have concerns about razor bumps that are best addressed with a good close daily shave. For some folks I know it works best for them not to shave daily, but to each their own. Most studies and I personally agree find that daily shaving works best to prevent razor bumps. 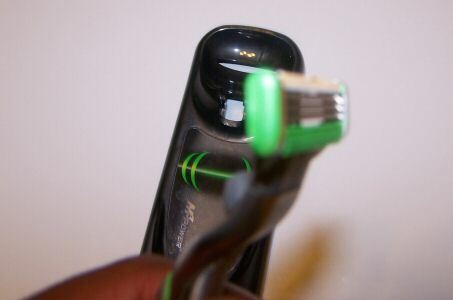 But with a wet disposable razor there is the issue of greater skin irritation. So this also is a concern I had to consider. Time to cut to the chase! I won’t delay which I felt was best any longer. I’ve tried both for over a week and found the Schick Quattro Power suited me best. Now I’ll detail my evaluation process and how I came to my conclusion. Basically my shaving routine starts with a couple minutes of a warm water towel (after cleaning of course). Then I use Black Opal Pre-Shave Daily Cleanser, since I’ve found it helps get the hairs up and stiff. Yea the warm water towel is enough, but hey I go overboard 🙂 . Next I put on the Black Opal Desensitizing Clear Shave Gel. This gel is MUCH BETTER than other gels I’ve ever used. I’d recommend anyone of any race try it. Because it has a mix that desensitizes the skin. SO YOU FEEL LESS PAIN IF YOU DO SOMETHING THAT MIGHT USUALLY BE PAINFUL. Just great stuff. Then I shave. Afterwards I used Black Opal After Shave Relief Lotion. Which I’ve also found to be MUCH BETTER than other after shave fluids I’ve tried. It goes on smooth like a lotion and has NO BURN. It is another product I recommend to people of all races. Although Black Opal products were original made by a Black dermatologist with Black skin care issues in mind, the shave gel and after shave lotion are products I am sure anyone would like. 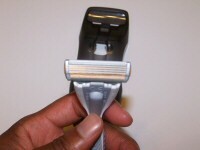 When using the M3 Power I felt it gave a great shave, but I had some issues with it. Because it did not seem to allow me to shave quickly through all portions of my face. I spent a lot of time going over the same tough areas repeatedly. That results in a longer shave, more potential for cuts and more potential irritation. I will say the M3 Power is better than the non-powered version which I’ve also tried before. That vibration does help the razor glide through the hair better. No the vibration does not cause hair to stand up, but it does help and you can easily tell the difference. After using it I was like “WOW”. Not only did it offer a great shave, but many of those tough areas were smooth with no stubble after a single pass! Now there are some spots I do still have to do a repeat run across, but I have that to a lesser degree with the Quattro Power. Also, my face felt much smoother after using the Quattro, which I was surprised by. I figured an additional blade would not result in a smoother feel at all. So bottom line, 4 with power has proven to be better than 3 with power for me! The blades’ spacing and angles may also be a factor in my results. But the Quattro basically does the job better for me. 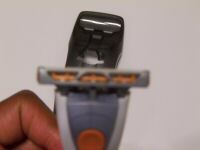 Some who have used the Quattro complain that the wires holding the 4 blades get in the way of a close shave. If you look at my side-view picture above of the Quattro you can see the vertical wires going over the blades. I did not find that the wires affected my ability to get a smooth close shave with the Quattro. 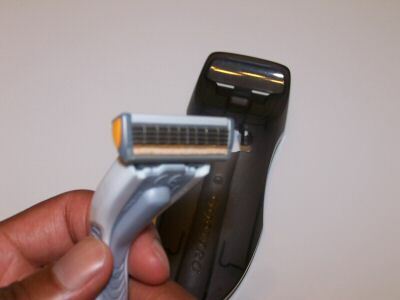 Now Gillette has announced they will introduce a 5 blade razor next year named the Fusion Power. Will 5 prove better than 4? Maybe, we will see 😀 .